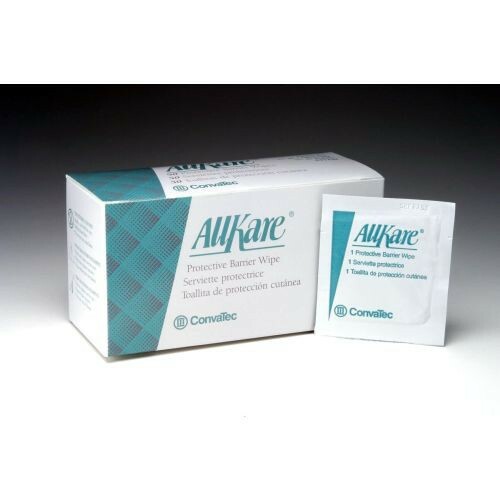 AllKare Protective Barrier Wipes create a strong, comfortable barrier film on the skin that can be conveniently used beneath tapes, skin barrier products, adhesives and hydrocolloid dressings. This non-irritating barrier film protects against excoriation and adhesive buildup for a completely comfortable user experience. AllKare Protective Barrier Wipes gently and quickly remove all adhesives including skin barrier products, tapes and hydrocolloid dressings. If you're searching for a way to reduce hassle and irritation, look no farther than these completely protective barrier wipes. You might also be interested in similar barrier film products that we carry, such as Protective Barrier Film Wipes. Specially formulated for use with Stomahesive and Durahesive skin barriers. Gently removes all adhesives including skin barriers, tapes and hydrocolloid dressings. We need these wipes in the home facility. Medical staff and patients alike usually use this. We regularly order bulk of these through your company. You're prices are low compared to other known medical supplies company.